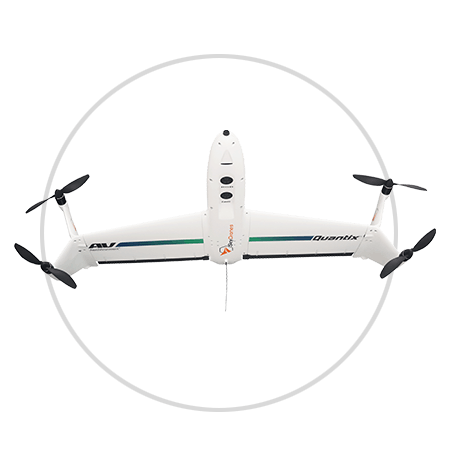 Quantix™ is an innovative drone featuring a powerfully simples, autonomous flight with operator in the loop and a unique, hybrid design that allows the aircraft to launch vertically and transition to horizontal flight; maximizing aerodynamic efficiency and range. Within a single flight, its sensors capture high-resolution color RGB (Red, Green, Blue) and multispectral NDVI (Normalized Difference Vegetation Index) imagery that provides you with instant, actionable intelligent insights to help guide decision making and improve operational efficiencies. Powered by the american company AeroVironment, Quantix integrates with the AV Decision Support System (DSS) for deeper analyses of the collected data. The DSS automatically stores and process the images into high-resolution aerial maps, features toolsets for deeper analysis and comprehensive survey reports to help guide decision making and improve operational efficiencies. Fully automated takeoff, flight and landing with operator in the loop. Simultaneously collects high resolution (1″/pixel) color R, G, B and (2″/pixel) multispectral R, G, NIR images. Or get in touch for questions and commercial info.